(1) Hydrogen/oxygen rocket, based on the Pratt & Whitney XLR-129. (2) Hydrogen/oxygen LACE rocket based on the Pratt & Whitney XLR-129. (3) Rocket ejector ram-scramjet airbreathing to Mach number 10, transitioning to a hydrogen/oxygen rocket, based on the Pratt & Whitney XLR-129. (4) Rocket ejector ram-scramjet airbreathing to Mach number 12, transitioning to a hydrogen/oxygen rocket, based on the Pratt & Whitney XLR-129. The design payload is 19 tons (41,895 lb) of propellant with a bulk density of 999.4 kg/m3 (62.4 lb/ft3). 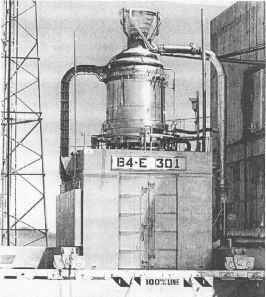 A launcher for the design payload was sized for each propulsion system. For different propellant densities, the size and weight of the launcher is different, and these corrections are discussed later in this chapter and are given in Figure 5.6.